Here is a great listing of online tools that can be used by writers constructing a novel. I especially like the applications that can track characters and allow you to create profiles for them. I could also see where it might come in handy for a game master who is running a particularly character-heavy RPG campaign. This entry was posted in Tips and Tricks and tagged editing, novel, online, rpg, writing. Bookmark the permalink. Cool list of online tools. I used http://highrisehq.com/ to manage my book. Glad you liked the list… I was really excited to use some of the tools, too (for writing AND RPGs as well). I really need to get back to NANOWRIMO now that I’m no longer a student. 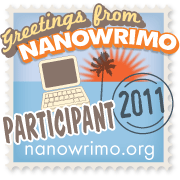 I keep contemplating trying NANOWRIMO but usually chicken out…I may have to take another look and strategize.